Makeup, Beauty and More: One of the prettiest pink lipsticks out there! One of the prettiest pink lipsticks out there! 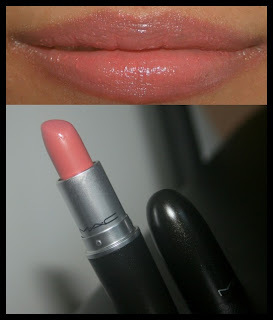 MAC Fanfare is one of the prettiest, girlie shade of pink that I've tried. It's a light creamy pink with no hint of sparkles.I love pink lipsticks but, always tend to stay away from blue-based pinks as they look totally hideous on me. MAC describes this one as a Mid-toned yellow pink. The finish is Cremesheen, one of my favorite finishes from MAC so, there's room for plenty of moisture. What do you think? This would be a perfect warm shade for all skin tones. A great, versatile shade of pink that can be paired with a variety of eye looks. Have you tried Fanfare? What are your favorite pink shades? Share your thoughts! wow! tats a gorgeous color! love it.will check it out. never ever looked at this .. I agree, this is really pretty pink shade and it looks really nice on your lips too. My fave pink is Rimmel's Nostalgia. It's a bit brighter than this but seems to be in the same color family. @Rashmi - Thanks :) This shade will be a great addition to your MAC collection :) You gotta try it...u'll love it I am sure!!! Appu what's your shade in MAC? I wanna know if this will work for me. I am a MAC NC40 :) I am sure this would look good on you from the pics of u that I've seen...its not blue based so, it'll look great on most people!!! fanfare is one of the lipsticks i have short listed to buy, along with ravishing and bombshell. does this shade have any lilac undertones? it looks beautiful on you.